Noorjehan Bilgrami. 'Molsri key saaye taley' IX and XI, 2015. Acrylic, graphite and rice paper on Arches paper, print segments on archival ink. Pakistani artist Noorjehan Bilgrami pays homage to the fragrant, blossomed trees beneath which she played as a child in Hyderabad, Deccan, in these photomontages. 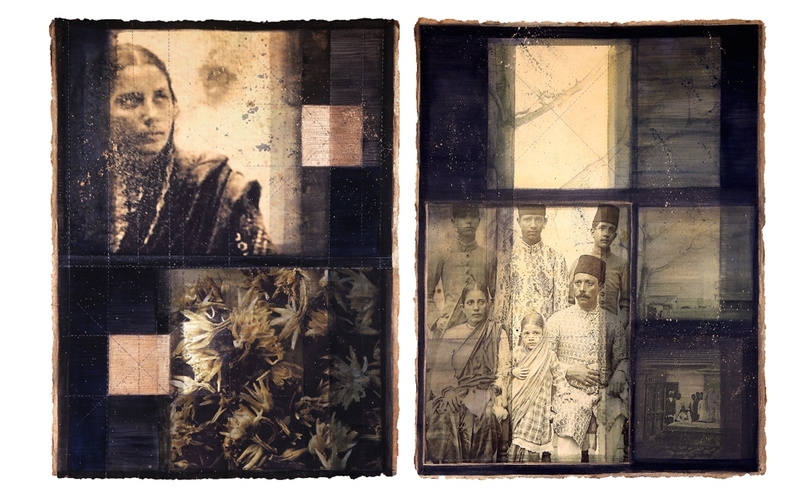 Referencing history through family photographs from the early 20th century, these large-format, sepia tone photomontages are enhanced with discreet washes and embellished with accents of gold. The stitching effect, reminiscent of ralli (quilt) work found in traditional Sindh textiles, tacks together and seals a prominent square that echoes throughout the series. The artworks serve as sites of memories with questions of dwelling and passage forming a rich, ambivalent landscape. Bilgrami is a visual artist, art educator, textile designer and researcher. Her interest in traditional crafts led to the formation of KOEL in Karachi, an atelier that pioneered the revival of hand-block printed fabrics in Pakistan. She is also one of the founders of the Indus Valley School of Art and Architecture in Karachi, and has been a member of the Higher Education Commission for the Government of Pakistan. This exhibition is presented in partnership with Shangri La: A Museum of Islamic Art, Culture & Design. Noorjehan Bilgrami will be artist in residence at Shangri La May 4-19. • Read an in-depth interview with Noorjehan Bilgrami on the museum blog. • Noorjehan Bilgrami leads an indigo workshop at the Art School, May 13. • The Romance of Indigo: A Talk with Noorjehan Bilgrami, May 7, 3pm at fishcake.